The TAD (Generally Available Telescope - TelescopioAbiertoDivulgación) located in Tenerife allows solar photosphere observations. It is a robotic telescope and every Internet users may gain access to the telescope by creating their account on the GLORIA project website! Each observation session (or "experiment") lasts 15 minutes and the users can make observations between 15.00 and 19.00 UT. 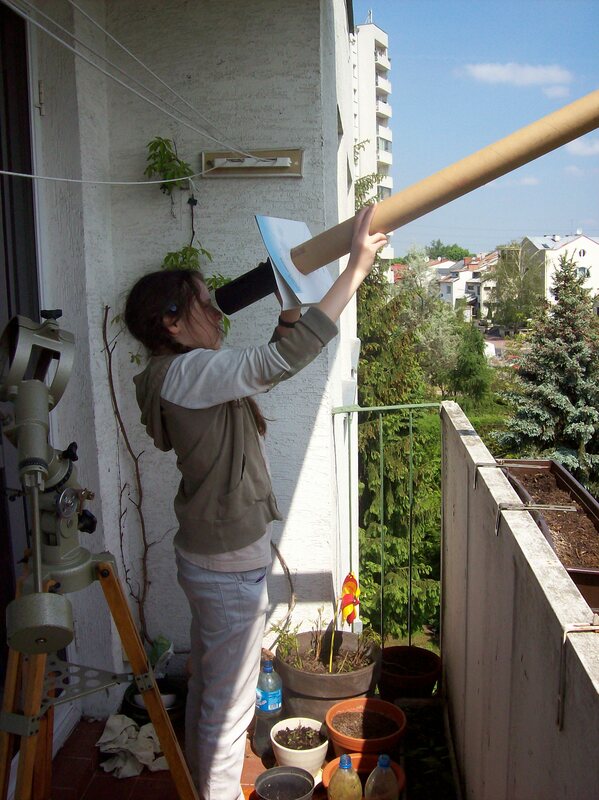 >>Here<< is a manual to use this telescope. Use this link to sign in and begin to use this wonderfull tool! There is a new dead-line through the national Comenius agencies for application to EU-HOU training sessions and seminars. We organise two 5-days training sessions entitled EUHOU: Hands-On Universe, Europe. Bringing frontline interactive astronomy in the classroom (FR-2013-408-003) due to be hold 27-31 May 2013 in Paris. You can register now, the deadline is 16th January 2013 ! This same deadline also applies for submitting application to National Agencies in order to attend the summer school organized in the framework of the Discover the Cosmos project, to be held in Volos, Greece, from July 30th to August 4th, 2013. To get a larger map. The transit of Venus is the passage of Venus across the Solar disc. It was expected in Paris between 5:50 (hours of sunrise in local time) and 6:40 (time of last contact). To be observable from Earth, the Sun, Venus and Earth should be in a particular configuration, which happens very rarely on the scale of a human life. Indeed, the next transit will not occur again before December 11, 2117. The team included representatives of France, Italy, Portugal and UK! The sun, our nearest star, occasionally allows us to observe spectacular astronomical phenomena: eclipses, appearances of large sunspots and solar flair fields, or passing of the inner planets (Venus and Mercury) between the Sun and Earth. In the morning of June 6, 2012 we will be able to observe the passage of Venus against the solar disk. Transits of Venus are quite rare (we will have to wait for the next one until 2117) so it is not surprising that the forthcoming event is of great interest. Unfortunately, observations of the Sun are neither easy nor safe. The Sun must not be viewed with the naked eye, and under no circumstances can you look at it through binoculars or a telescope without a proper filter unless you want to go instantly and permanently blind! Some shops offer special eclipse glasses, however, due to the minimal diameter of the visible Venus (less than 1 ") they are not very useful for observing planet transits. Therefore, for those who would like to observe the transit of Venus with their own observation instrument - we prepared a description of a simple pinhole camera (ie from Lat. Camera Obscura) for the observations of various phenomena occurring on the Sun. During the last EU-HOU training session (2-6 April 2012), which has gathered in Paris 13 teachers from 7 different countries through the Comenius national agency life long learning program, Alexander Rudolph (Cal Poly Pomona, USA, on sabbatical at UPMC, France) has presented a successful kinesthetic activity. Here are some snapshots illustrating the main aspects of this activity. This was intended to illustrate the current development of the EUHOU-MW small radiotelescope network for schools: it enables to study the hydrogen gas of our Galaxy the Milky Way. Observations performed through a Web interface enable learners to detect gas velocities, as shown in this kinesthetic modelling. There is a new dead-line through the national Comenius agencies for application to EU-HOU training sessions and seminars. We organise two 5-days training sessions entitled EUHOU: Hands-On Universe, Europe. Bringing frontline interactive astronomy in the classroom (FR-2011-359-006) due to be hold 15-19 October 2012 in Athens and 12-16 December 2012 in Paris. We also offer a 2-days seminar entitled EU-HOU - Connecting classrooms to the Milky Way (FR-2012-360-002), based on our remotely controled radiotelescope network, on 22-23 November 2012 in Coimbra (Portugal). You can register now, the deadline is 30th April 2012! Want to know more about radio astronomy? Click on this link to download our exhibition in A4 format, easily printable and usable for classrooms activities. In this document, you will learn a lot about how radio waves can contribute to unravel the mysteries of the Universe. You will also learn the difference about radio waves and sound waves, and compare the radio emission from a star to the strength of a mobile phone signal. This work was done by the EU-HOU members, in collaboration with Science à l'école, a project from the French ministry, and Paris Observatory.